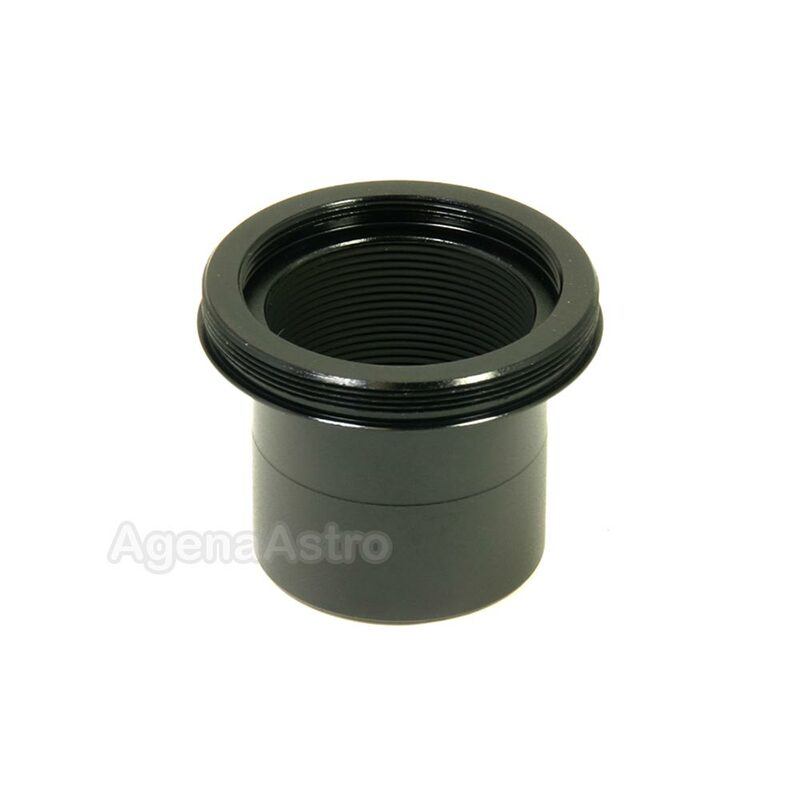 Baader Planetarium's 1.25" T-2 Nosepiece allows you to mount your T-2 accessories or Digital Camera into standard 1.25â focusers or accessories. This enables you to do prime focus photography. The nosepiece has an external T-2 thread on one end for attaching to T-2 system components. Typical applications include use as the input piece for the Baader Precision Amici Diagonal and OPFA System (afocal and ocular projection). The nosepiece outside diameter is precisely machined and finished to provide a secure fit with a minimum of slop or de-centering. This nosepiece features a recessed groove that provides an extra measure of security to prevent accidental slippage. The 1.25â nosepiece is provided with standard 1.25â filter threads as well as an internal M34 thread (inside the male T2 thread) for accepting Baader's VIP Barlow Lens or Glasspath Compensators (for Baader/Zeiss Bino-Viewer). This nosepiece also incorporates full internal sharp V-threading and blackening to reject stray light and maintain maximum contrast. This component is well made, works smoothly, is finished to match other Baader parts and is well baffled. I use it with other T-2 Baader parts including diagonal prisms. This Baader T2 1.25 adapter is top notch and has internal threading for filters - a nice surprise. Agena Astro is my go-to for astronomy items. This allows you to adapt t2 threaded items to a standard 1.25 nose. I use it to attach to my t2 silver diagonal so I can use it with my standard 1.25 visual back and filter turret. it has great finish, smooth flat black. Fits threads and 1.25 holders perfectly. Expensive but highly recommend this for anyone trying to fit any t2 threaded item into a 1.25 adapter or holder. Required to construct a versatile 1.25" and 2.00" Zeiss prism diagonal. Works as expected. High quality machined part. Perfect fit and finish.